The Perfect Program for any Company who only needs to accept Credit Cards once or twice a year. Need a Receipt Printer? We rent those too! Free Tech Support For Initial Setup Included! If you do not have one of the merchant accounts shown above, call us so you can apply for our short term Stripe.com or PayPal Virtual Terminal. (Call us to see which one will be best for you (224) 677-0283.) You will want to apply for either of these accounts approx 1 week before your event in order to get them approved in time for your event. (For a Stripe account, only need 1 day). For more info on these account to see which would be best for your organization, please call the USBSwiper sales departments at 224-677-0283. Once you order our rental products, the software will stay in activation for a period of 2 weeks. This gives you a week to get the software interfaced and tested with the merchant account and a week to use the system for your event. After the 2 weeks the activation expires, you will no longer be able to process credit card transactions through our system. If you need slightly longer than 2 weeks, we will be happy to work something out with you that will be beneficial for all parties - so please contact our sales department at (224) 677-0283 to discuss your needs. If you return the Swiper to us within 5 days of the software expiration, we will rebate $10 to you as long as the swiper is still in like new condition and still is operational. As shown above, upon return of the swiper (within 10 days after the software expiration) in like new condition, we will refund you the $10.00 swiper rental cost. You would want to download the software about 5-7 days before your event so that you can speak with our technical service department in order to sync up or interface the software to your Merchant Account. Please allow 30 minutes to one hour for interfacing time and testing. The swiper ships "Priority Mail" which would get to you in 2 to 3 business days. So if you order everything one week before your event, you will have plenty of time to interface it, test it, and use it during the 2 week activation period. You can also pay for expedited shipping if needed. As mentioned above, you will need to have a Merchant Account from either Stripe, PayPal Payments Pro or PayPal Virtual Terminal, PayPal PayFlow or Authorize.Net in order to use our software. Also, if you also take phone orders for your products or services on an ongoing basis, it may also be beneficial for you to keep the account open and actually purchase our product instead of the rental program because our interface can also be used to key in phone orders as well. More features and benefits of our solution can be seen in our benefits page link below. These numbers represent our current pricing structure for our rental program. Please keep in mind that our rates, prices and fees are subject to change at any time as are the Merchant Account Fees. 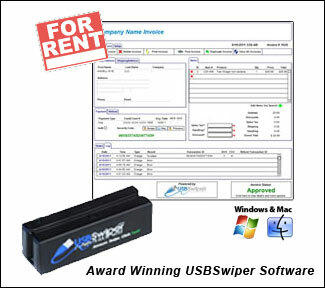 Software rental if you already have our swiper is $50.00 for 2 weeks. If you have any other questions, please feel free to contact us at (224) 677-0283. Merchant Account policies, rates, and programs are subject to change at anytime and therefore those offerings being offered through USBSwiper.com will also be subject to change at any time. Merchant Account Provider is solely responsible for the approval and or disapproval of any Merchant Account application as well as any restrictions that they may impose on the merchant account including any and all holdbacks that they may require. Cross border processing rates may be slightly higher. When we started booking more events where customers ordered DVD's, we needed to find a more efficient payment option other than cash/check - or invoicing after the event. USBSwiper provided a very cost effective solution that allowed us to swipe credit cards, at the event site - regardless if there was internet coverage! The transactions were easy to set up and process - especially with the batch process function. Tech Support was very accessible and responsive as we set up our processes.We highly recommend USBSwiper!